For as long as I remember I have always craved for a semblance of order. An order in the way my house was arranged, with everything in it’s place. A carefully planned schedule from the time I woke up till I retired for the day. It made me feel productive. That is till two years back a beautiful hurricane entered my life and forced it apart with the loudest cry of life she could muster. All resemblance to order was thrown out of the window. Everything I thought I knew about myself was put to test. Motherhood caught me by the reins and turned my world upside down. I yearned for that predictability. I felt comfortable there and being here, I felt like a fish out of water. I tried to bring that order into our lives failing miserably each time and yet coming back even more determined not realizing that this wasn’t the way it was supposed to be. I had to learn to embrace this unpredictability, the unpredictability of life that comes along with a child. The unpredictability of a child whose smiles, tears, play all move like the two extremes of a pendulum. For my own sanity and that of my family’s I had to throw away many of my preconceived notions on discipline, learning and milestones out of the window and accept this world of uncertainty wholeheartedly. I as a mother am a work in progress. As my daughter grows, so do I. I move few steps forward some days only to find myself a step or two back the next day. But that is the gift of parenting- a gift that keeps giving. A gift of chances even after screwing up, to make up to our children and by extension ourselves. A chance to raise a strong, healthy and contributing member to the society. It isn’t all moonlight and roses. There are times of guilt and anxiety. But if I stop and look closely there are so many beautiful moments that far outweigh the not-so-good times. I just need to be mindful of these moments, recognize them and receive them. So, this is going to be my mothering project. A record of these moments of clarity, these 'A-ha' moments that brings me closer to my daughter and brings me closer to the mother I want to be to my children. A reminder for the days to come and a memory of the days that went by. Feel free to join me in this long journey of discovery. Join in whenever something works for you and even when something doesn’t. Let’s accept our vulnerabilities for the sake of our children and come out stronger on the other end. We owe it to them and ourselves. As a child grows, everything in their surrounding contributes to their development, from the sounds they hear to the things they see, and that includes us, their parents. A language rich environment goes a long way in taping into a child’s sensitive period. 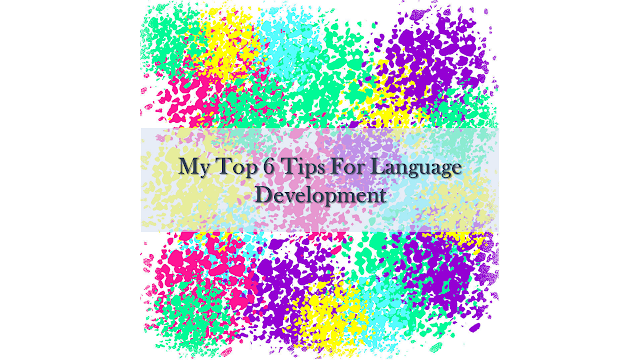 The sensitive period, or a child’s natural disposition to acquire language starts from birth to the age of 6 years. It is amazing how much a child learns just by listening to the words a few times. You can find them repeating the words, rolling the sounds in their tongue to get the feel of the words till they master them, just like any other skill. So, I am going to share just 6 points on creating an environment that will aid in this development, inshallah. 1. Talk to your child- This starts from day one. When you do something for your child, talk them through it. During a diaper change say, ‘I am going to change your diapers. Let’s put on some lotion. ‘This is a new diaper’ etc. When bathing them say, ‘Let’s take a bath’, ‘Now, let’s wash your hands’, ‘Let’s put some soap on your legs’. When you repeat these phrases and words every time, your child would start to connect them with the action and learn the new words. 2. Do not use baby talk- Use clear and precise words. Do not dumb down things for your child. For example, use the word ‘Biscuit’ instead of ‘Biki’ or ‘Rice’ instead of ‘mummum’. 3. Combine words with action- Association of words with actions helps the child to master the language faster and let’s face it, it is also very entertaining. This involves rhymes and action songs like ‘Head Shoulder Knees and Toes’ or ‘Wheels Of The Bus Go Round’. Using phrases such as ‘Catch the ball’ ‘Run to daddy’ ‘Jump’ etc during a simple game is also a fun way of teaching language. 5. Books and toys- I can’t emphasize how important this is but introduce books from the beginning. Let it be a pleasant experience. You don’t necessarily have to read it word by word but can use your own language and describe the pictures in the book. Allow your children to hold and turn the pages of the book so they feel involved. Children love listening to stories and this introduces lots of new words, grammar and imagination. 6. Learn language through play- While getting toys, try to get those that encourage interaction with the toy. Greater the interaction, more the child learns. Electronic toys with music and lights do not give children much chance to do anything at all. Wooden toys or traditional toys foster the child’s imagination and helps them to decide for themselves what they can do with it. These are just a few tips I am sharing with you to get started on that sensitive period your child will most probably be on right now. They helped my daughter and I hope it helps you too. Have you found yourself planning out your child's day only for things to fizzle out before the day is even over? 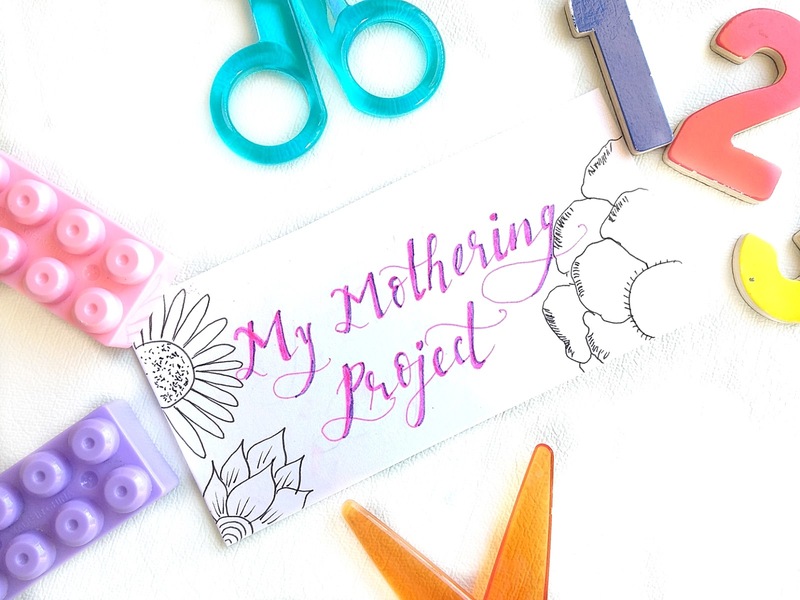 Have you found yourself tired and upset because your child did not find the mini farm house/scented-all-natural-completely-edible play dough/sensory bin you diligently scoured the internet for and made, interesting? Or have you ever noticed how in the madness of the day we somehow miss out on the important things? If you haven't, props to you mama! I would love to learn how you do it. And to the many of you who found yourself nodding yes to at least one of the questions, join the club! As mothers we want to give our children every opportunity that is within our means to explore, discover and learn new things. But sometimes it is just the little things that go a long way - like reading a book together or a walk in the park. 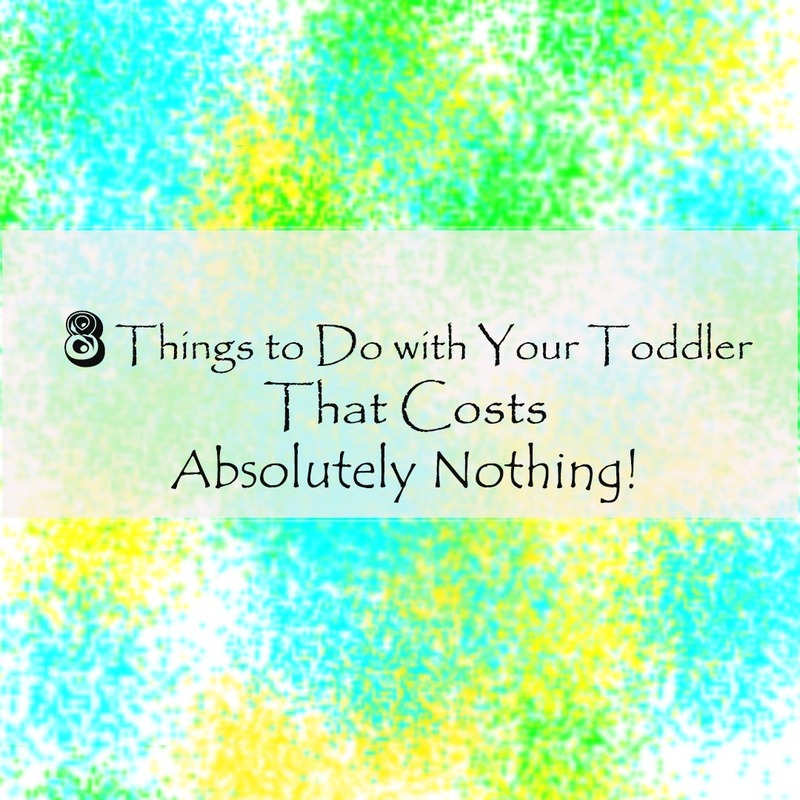 So, I decided to sit down and make a list of things we can do together with our kids that doesn't require any elaborate preparations or costs any money. 1- Looking at the sky together. Every day,morning or night, go to the rooftop, balcony or window with your little one. Together look out and point out the things that you can see like the birds, stars and even a plane that may be passing by. You can also try to make out the shapes of the fluffy clouds and maybe tell a story or two about them. 2- Shadow play. This is my personal favorite! After taking a bath and putting your child in her warm pyjamas, switch off all the lights and switch on your flashlight. Then go ahead and admire the wonder in your child's face! Make shapes of animals, man and anything really with your finger. You can also make a big hand shadow and pretend that it is coming down fast to catch her only to tickle her till she dissolves into a fit of giggles. Then take turns 'catching' each other with your shadows. 3- Take your child at the park and join in the fun! Have a go at the swing, see-saw or even the jungle gym. Become your child's favorite playmate for the day. 4- Have your child help out in the kitchen. Let him see where and how the things are made. Talk about what you are cooking have him pitch in wherever he can. Involve him in little tasks like mixing something or bringing a vegetable you need. 5- Chase each other around the house! Nothing gets you all energized and heart pumping like running behind a toddler. It is every mothers story! So why not turn it into a game and have fun at the same time? Take turns chasing each other around the house and while you are at it, hide too to make the game a little more interesting! 6- Have an all out water game, splashing each other with water! I have a child who wouldn't mind playing in water however long it takes. So, bath times are quite fun! Just give her the shower pipe and take turns drenching each other with water! You can also fill mugs with water and use them in your water play. 8- Sing songs from your childhood to your child. Be it a song from your favorite cartoon you used to see or even a nursery rhyme. Dance along to the song and take your child's hand twirl around the room enjoying the moment! These are just a few moments I could think of. I am sure you will be able to come up with many more. Toddlers! Can they be more active? A bundle of energy, perpetually curious and always on the move. They are constantly on the look out to discover something new in this ever expanding world. As parents, their energy, not to mention the daily grind, can leave us a bit over-whelmed. But guess what? It really doesn’t have to be this way. A little planning and scheduling can go a long way in helping us gain our sanity as well as spend quality time and a productive day with our kids. When we moved to India, all routines and schedules went out the window. Every day would pass by haphazardly and unproductively. I knew I had to make a conscious effort to bring our lives back in track. And that is when I started planning our day out. I have been working on scheduling my daughter’s day for the past one month and it has worked wonders! You see, children thrive on routines. Even as an adult, don’t you feel that the day goes smoothly when you know what comes next? It is the same with children. Now my favorite part- Planning Activities! There are so many things you can do here. 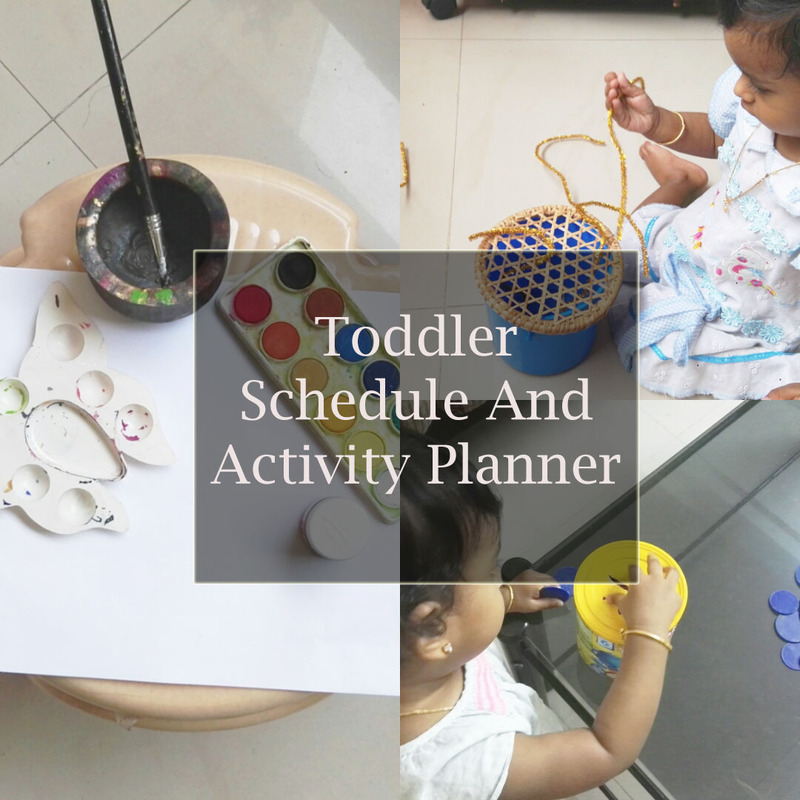 I found this super helpful since I planned the activities keeping in mind the materials already available at home. All I had to do was prepare things before hand and lay it out for Amina to play with. To bring in a variety, I added 2-3 activities under each target area. Some activities also targets more than one skill. For instance while playing with a dough the child works on her fine motor skills, sensory skills, as well as language skills when you introduce new vocabulary such as press, sticky, roll etc. Of course, there will be days when all plans will lay forgotten and you just want to get yourself through the day. Many a times you will also have to be flexible to accommodate a toddler's unpredictable behavior. And that is perfectly alright. One thing I would like to mention is, as much as I do plan, I also sincerely believe that adults need to take a back seat and contribute just enough where we do spend time with our children but at the same time it is the child who is leading the play and not us. Note- I wrote this the day I was leaving Kuwait but couldn't post it till now. The bags are packed and the cartons are sealed. I look around and all I see are the bare walls and empty floor. Today is our last day in Kuwait, our home for the last three years. There are so many thoughts and emotions going through my head right now that I have to consciously to keep them in check. This was the first place I started my married life in. The first house I brought Amina to and the only house she knows. Every little corner, every piece of furniture holds a memory. As much as I loved my house I never truly realized how important it was to me till we started selling off our things since we are moving countries. Every time something would go, it would leave a lump in my throat just looking at the empty space. It was a constant reminder of the changes that are to come. Most importantly, it drove home that nothing at all is permanent in this life. I was very comfortable and content in the life Allah had given me. I never thought that we would be facing a big change in our lives in just three years time. But that is the Will of Allah. And, as much as I would miss our home, I know there is one thing that is within my reach. The memories we made as we built our family. These memories will inshallah remain. And Alhamdulillah I'm glad that I was able to make these memories with my husband and the wonderful people around me. Because this is what is going to stay in the long run. When I look back many years down the lane, I won't be looking at the tangible. Instead I will be looking at my first day in kuwait, the first eid we spent as a couple, the day I came to know I was pregnant, the day I brought Amina home, the day she took her first steps, and many more. You see at every turn in our life we make little memories here and there. We collect them all in a bag and tuck them in one place. And one day, when we sit down and wish to visit the past, we just have to open the bag and look at all the lovely times . These memories that we make everyday stay with us. And if it is with the right people the memories are even more beautiful. 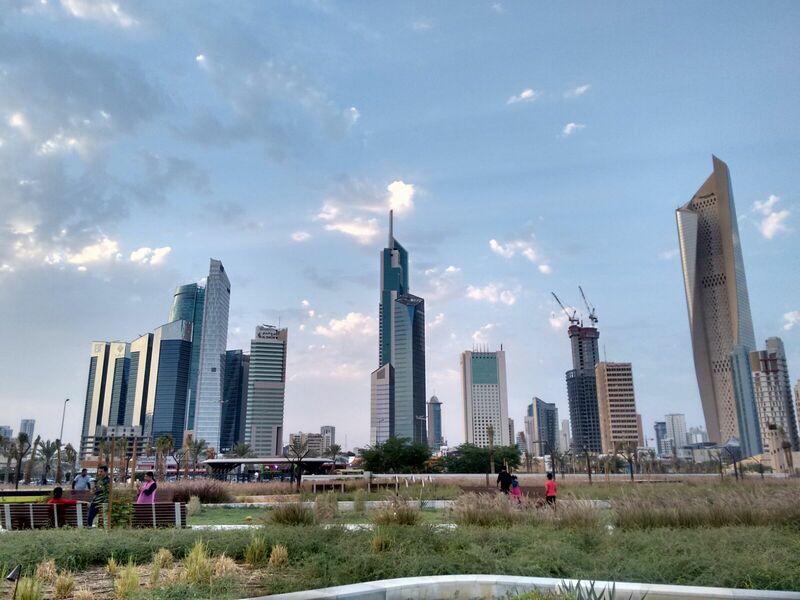 Kuwait was very kind with me and I had a wonderful time here. I met some of the best people here, some of whom have become friends for life. And as much as I am sad about leaving, I am also excited about the new life Allah has planned for us, and I can't wait to see it unravel. Have many times have you opened the Quran, only to have an ayat speak to you? Sometimes when we are at our weakest, we desperately seek the warmth of a hug or a kind word. Some are fortunate to receive that. But what happens when all we are met with is a cold shoulder and sneer? Where do we go looking out for that comfort and warmth? What we fail to realize is that there is someone closer to us than anyone else. Who knows us so well. Far better than our mothers know us. Far better than we know ourselves. Our Creator. Our Sustainer. This verse didn't resonate with me as much as it has today. I was recently talking with one of my good friends who had just gotten out of a toxic relationship. This girl,single-handedly, traveled two countries to reach India, with her toddler son, to escape her abusive marriage. I have traveled with Amina when she was about that age and I know how much preparations, both mentally and physically, had to be done. It isn't easy. So, just imagine what she must have gone through, through all that mental turmoil. Nevertheless, she had to make a decision for herself and her child. But, Alhamdulillah, she wasn't alone. In her own words, she received help. Some from unexpected places and people. People, who till yesterday were strangers. From the taxi driver who was there to pick them up and who made sure they boarded the flight, to the officials at the embassy who ensured her safety. She told how with every little help she received she felt so blessed and loved. She felt like Allah was showing her another side of His world after all the days she spent in darkness. Subhanallah, this is what the verse meant! Allah is enough as a Wali and a Helper. 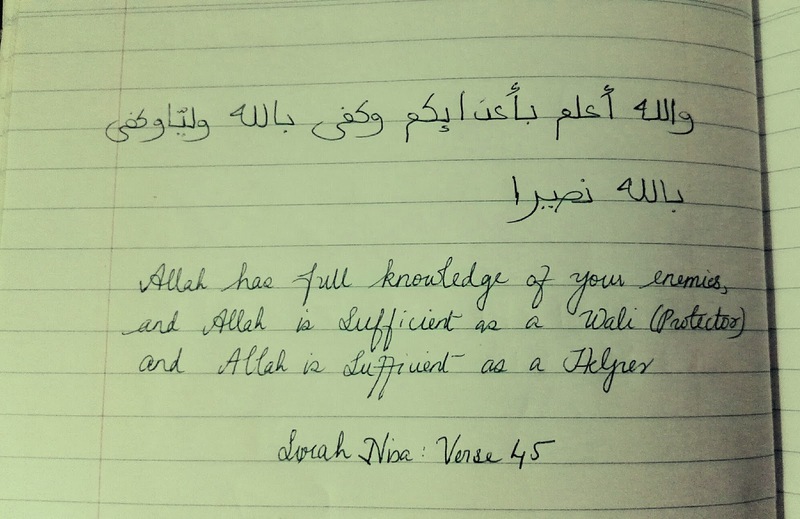 I shared this ayat with her and we were both struck by it's beauty and how real it felt to us that day. In a foreign land, when you are alone, surrounded by uncertainty, who else can you depend on to give you comfort and solace other than Allah. Let this be a reminder to everyone who is reading this, including myself, to turn to Allah alone in times of need. He created us. He is not going to leave us alone. Let this story of a young mother with her strong iman who took this important step, for herself and her child, remind you that Allah is always by your side and if need be, will send you His helpers, sometimes right to your doorstep. As Ramadan approaches, there are many articles coming up that help us in starting Ramadan in the right foot. This year, I've decided to join the bandwagon and write on what NOT to do in Ramadan. This is more of a reminder to myself first. 1. Do not enter Ramadan without any preparation- Remember that time you entered the exam hall, nervous, since you didn't prepare at all? You can guess how the exam went on from there.Yeah, this is something like that. By the time you reach the middle of Ramadan you would either be physically exhausted with the fasting or your spiritual levels might have dipped. Since none of us really want that to happen, try to up your game this time round, by preparing in advance. Fast once or twice a week to get yourself into the groove. Take your supplements so that you would have the strength to continue fasting. Make a list dua now itself so that you wouldn't have to scramble and rack your brain during taraweeh. Believe me, it can happen and you will be loosing a lot of time this way. 2. Do not spend a lot of time with your mobile/electronic devices- This. This is where the real test lies. At least for me. Many a times I struggle to put my phone down and it takes a lot of effort from my side to control this habit. I do realize this could lead to an unhealthy addiction, which is why I have planned to curb it before Ramadan comes around, inshallah. I set a time (say, 10 minutes) where I do what I need to, and then put the phone aside for the next 30 minutes. Meanwhile, I occupy myself with some work I need to do around the house, or read a book. Once I've established this, I plan to gradually increase the time I am away from the phone.It's been a week since I've started this practice. Alhamdulillah so far the 10 min:30 min rule is working quite well. 3. Do not spend a lot of time in the Kitchen - We desis have this habit of having lots of gatherings during Ramadan. Either we are hosting one, or are invited to one. And we all know what happens there. Everything, but the remembrance of Allah. And the host spends a lot of her time in the kitchen instead of in worship. This is a sure fire way of not reaping the benefits of Ramadan. So, what is the alternative to this? 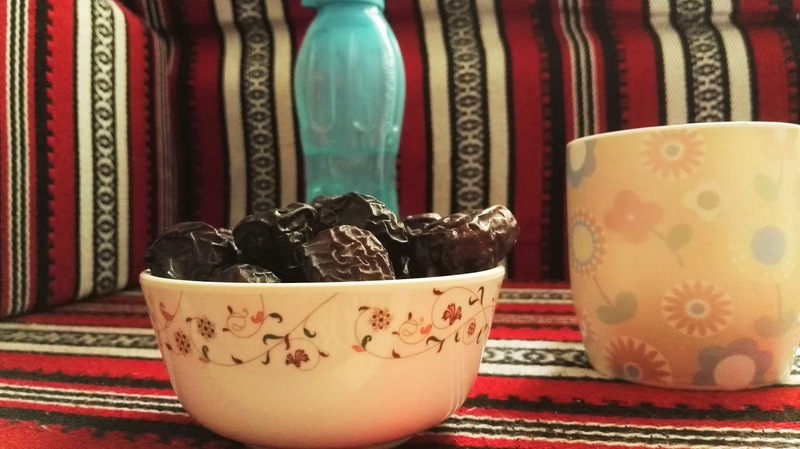 How about inviting your friends before Ramadan? This way you have the whole of Ramadan to yourself and Allah. And when you are invited, try to politely decline. But if you absolutely have to attend, stay for a little while and leave. Once there limit discussions in matters that are not going to benefit anyone. Rather, initiate topics on Islam, about forgiveness etc. Things that would remind each other about Allah. There is a hadith where it is said that the Angels descend in a gathering where Allah is remembered. Not only that, but they convey the people's duas to Allah and Allah confers His protection on those people and pardons their sins. Won't it be amazing if that happens to us? I bet it would! These are just three steps that you can start with right now. I believe it is better to take tiny steps when you want to change a habit instead of taking giant leaps which might leave you exhausted and discard what you started right in the middle of it. There are more you could add to the list if you want to. Think of a habit that might hinder your spiritual journey during Ramadan and work on that. As I mentioned before, this is a reminder to myself first and foremost. If you do benefit from this, Alhamdulillah, and please do remember me in your duas. May this RAMADAN bring in a change in us and may it be a productive one, Ameen.